For those of you who have truly appreciated the many years of UFO artistry and research I have dedicated to raising the vital issue of Exopolitics into public attention and wish to see these efforts continued please feel free to demonstrate just how much you value these efforts in a monetary donation. 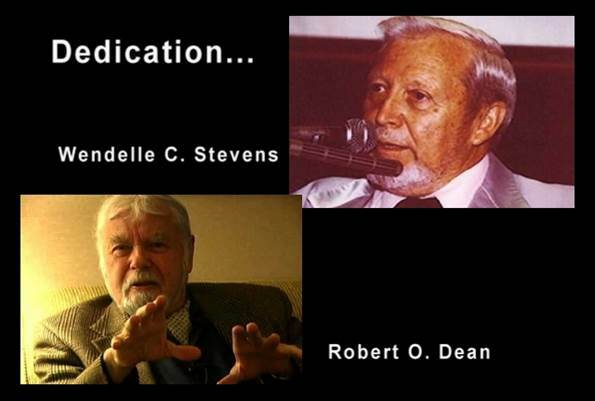 “The phenomenon reported is something real and not visionary or fictitious. There are objects probably approximating the shape of a disc, of such appreciable size as to appear to be as large as man-made aircraft. 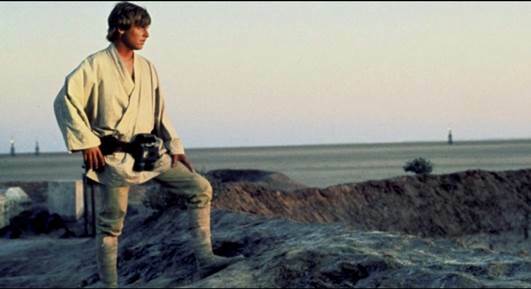 I could fully appreciate the lonely sentiment of a galactic farm boy from ‘long, long ago and far, far away’. 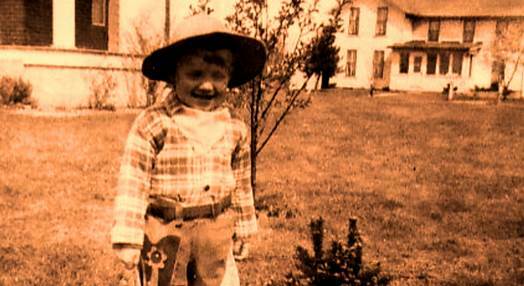 I was born a post-war ‘baby boomer’ to the flatlands of northwestern Ohio; raised to provincial, middle-class, small-town sensibilities. Our humble village was a convergence of state roads and rail lines—an island of humanity lost in a sea of corn, wheat and soybean fields. Life there was bland work-a-day tedium. The most excitement my rural kid-hood had to offer was watching the weeds grow. 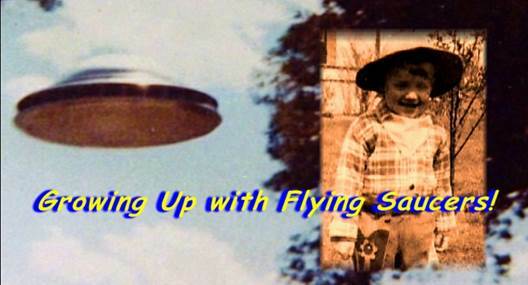 So you can guess just how electrifying the notion of ‘flying saucers’ visiting from outer space was to the festering, pre-adolescent imagination of an Ohio hayseed like myself! 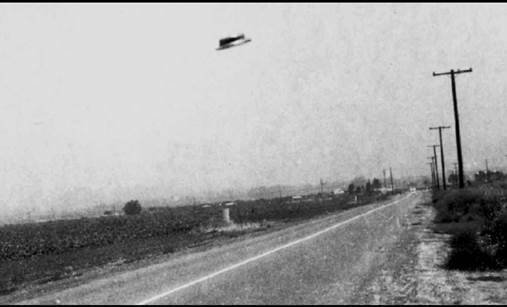 UFOs were a big deal back in the ‘Fifties’, and somehow I knew they were REAL! Hello, my name is Jim Nichols and I’d like to invite you to join me as I look back to those early days when the idea of visitors from the stars held such magic…! Was life truly simpler way back in the 1950’s or were we more simple-minded? 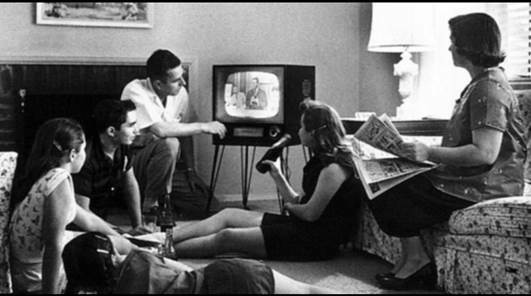 Ours was the first generation to find daily existence dominated by an incredible new electronic device called… television. 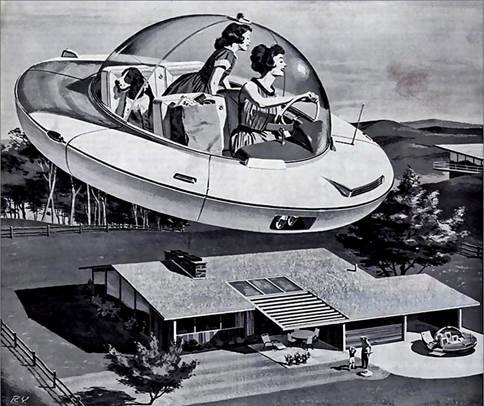 By the 1950’s we actually lived our daily lives in a science-fiction reality. So the notion of ‘flying saucers’ seemed to naturally fit into our world of ‘atomic-bomb’s, supersonic planes, rockets and Sputniks. It was all as much a part of growing up as hot-dogs, French fries and soda-pop. 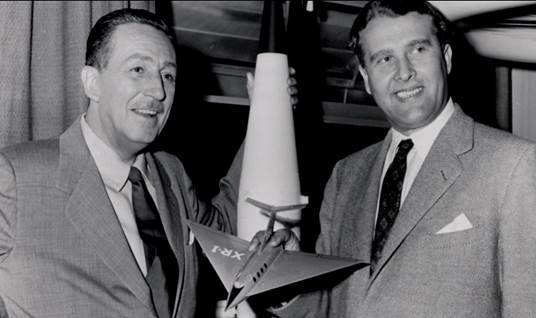 Even Davy Crockett and Pinocchio made room for space rockets when Walt Disney featured famous German rocket scientist, Wernher von Braun predicting future manned space expeditions on his ‘Man and the Moon’ TV presentation. 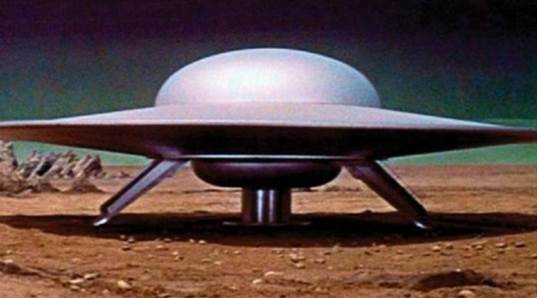 I loved that sleek saucer from “Forbidden Planet”, although Hollywood saucers were the only ones I ever actually saw myself. But even as a grade school kid, I realized grown-ups were genuinely concerned that something flying in our skies could not be accounted for. There were too many stories and photographs of circular flying machines, physical craft of intelligent design, which could not be accounted for, given our 20th Century understanding of aerodynamics—no wings, no propellers, no turbojets, no rockets! Yet somehow these machines were able to ‘fly’ by means unknown to Earthly physics. So, if they were not built by Earth humans--the unavoidable conclusion remained, they must have been built by ‘somebody’ from ‘somewhere’ else! And that could only mean that these flying contraptions were likely flown by intelligences from other worlds far out in space! However, despite enthusiastic public expectations, no official explanation was forthcoming from our government leaders. The President and all of his military advisors refused to provide any definitive answers to this mystery. Quite the contrary, UFOs were dismissed with official military disdain as mass hallucinations and Cold-War jitters. 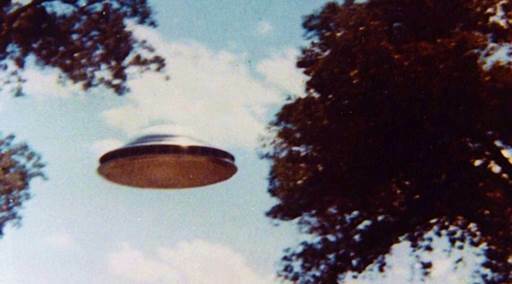 Still, flying saucers remained an enigma that simply would not go away… So, I formed my own answers to the UFO mystery. 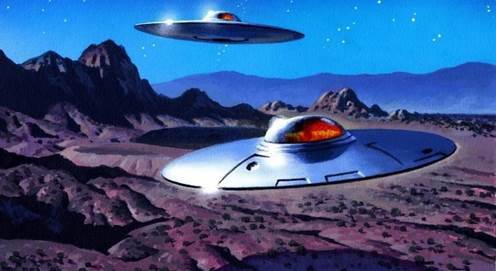 Since it was obvious that whoever piloted these saucers was not making war with humanity, or out to take planet Earth by military conquest, they must be random, curious explorers anonymously peeking in on our ways of life. If we Earthlings had ships to visit other planets, isn’t that what we’d do? I got the idea by watching shows like “High Adventure with Lowell Thomas”. 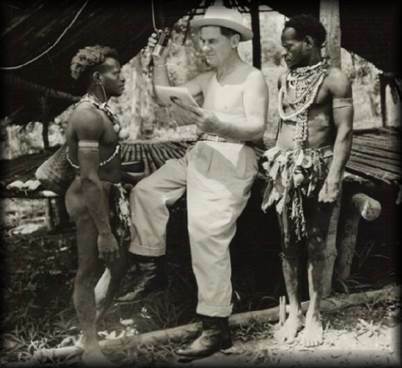 Here was a famous intrepid world explorer who aired films of his expeditions to the Congo, Borneo, New Zealand or the headwaters of the Amazon, showing the strange life-ways, customs and cultures of the native inhabitants there. Wouldn’t it seem natural for curious visitors from space to do likewise? Thus I formed my earliest no-muss-no-fuss ‘theory model’ that handily explained the sensational mystery of UFOs—they were merely curious visitors from other planets who flew in really COOL ships! And the tales told by George Adamski seemed to prove my theory. This California man, who lived near the famed Palomar observatory, claimed to have contact with beings from planet Venus. 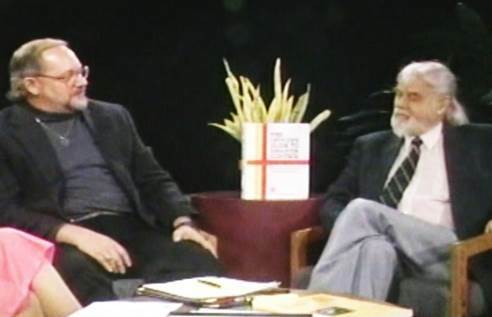 In numerous popular books, Adamski shared his accounts of visitation with friendly, human-looking Venusians who shared a message of peace and urged humans of Earth to cease their dangerous experiments with nuclear weapons. Perhaps no single individual succeeded more in making flying saucers the popular Fifties fad than George Adamski, but eventually he too was branded a fraud. Definitive answers to the UFO enigma remained elusive. 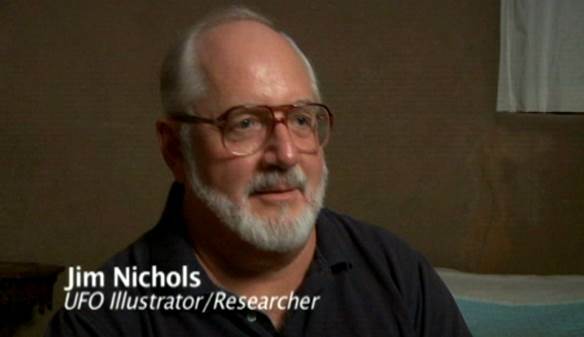 Yet my stubborn interest in the subject kept pace right up to my high school years. 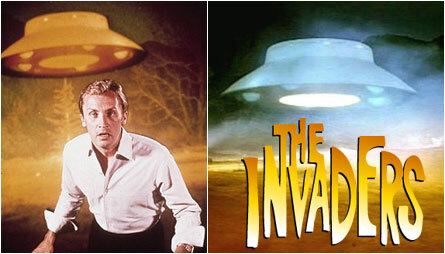 By then the popular topic had earned a weekly television series… “The Invaders”! And in those days, radio announcer Frank Edwards also had a personal campaign to convince a disbelieving world. 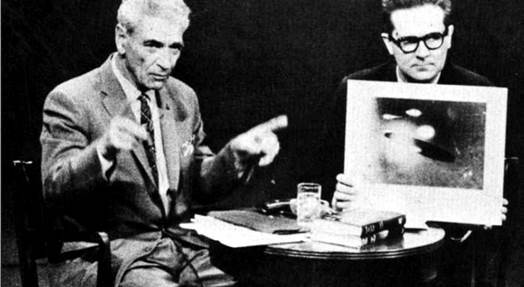 He published bizarre tales of the paranormal and UFOs in best-selling paperbacks like, “Stranger than Science”, and “Flying Saucers--Serious Business”; stirring accounts that rekindled the palpable, imminent thrill that the secrets behind the UFO mystery would, at any moment, be revealed. And by 1960, it seemed that Edwards was right! 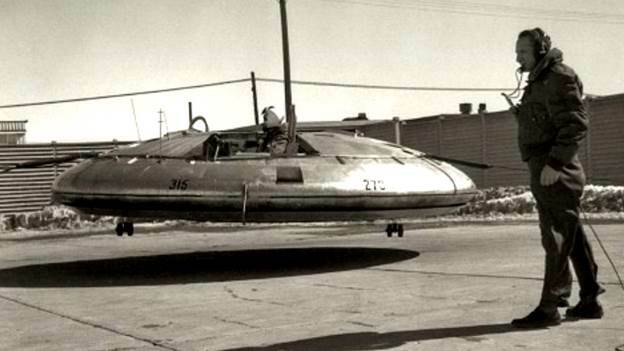 The Air Force finally displayed a ‘Flying Saucer’ aircraft of its own invention… the AVRO disc! However, despite its appearance like a sleek, silver, Hollywood saucer, this clumsy contraption bobbled and wobbled, barely lifting off the runway. 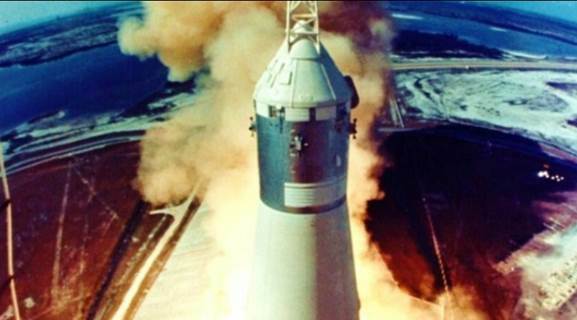 For the remainder of the 1960’s, silly saucers would be no match for America’s awesome space rocket program! Growing fear of Soviet missile superiority and threat of nuclear attack sparked an obsession with rocket design competition that dominated world attention for the rest of the decade. The Space-Race was on! 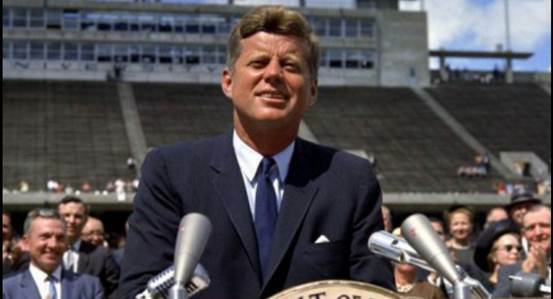 Determined that the United States would win this super-power race, President John F. Kennedy announced in May of 1961, the riveting mandate that within the decade the United States would launch men to the moon! What a time to be alive. 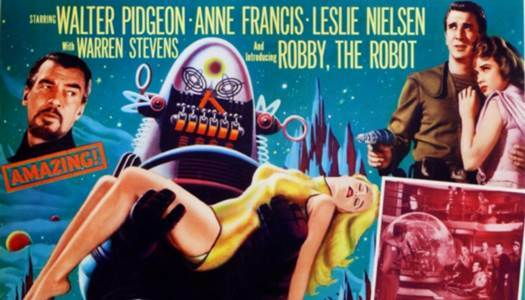 I was indeed born into an era of science fiction reality! With or without flying saucers, we were poised on the threshold of an era rich with seemingly unlimited potential. The prospect was mind-boggling. We can do anything! 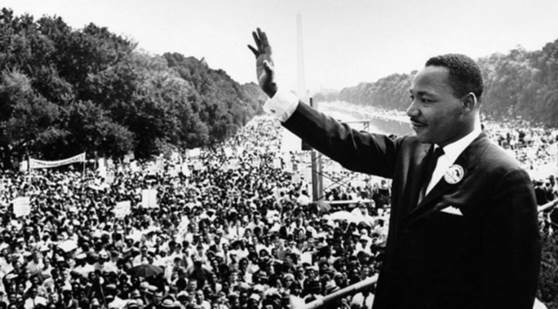 For ‘one brief, shining moment’ we rode the wave of euphoria--Perhaps at last, humanity would find a collective endeavor more meaningful, uplifting and rewarding than . . . war! The optimism died. 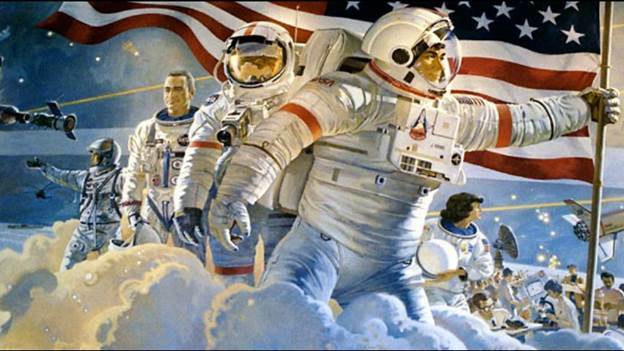 John Kennedy never lived to see the culmination of his stirring mandate to land on the moon. 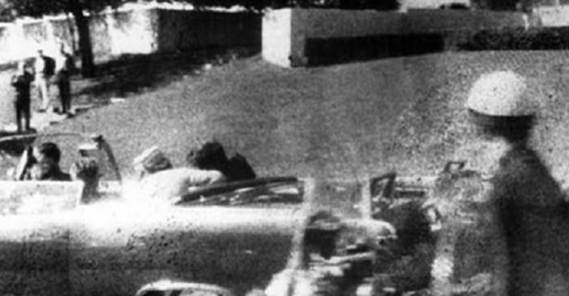 Following his murder in the streets of Dallas much of America’s gross national product--funding that could have advanced space exploration—was squandered on meaningless carnage in the Vietnam War. 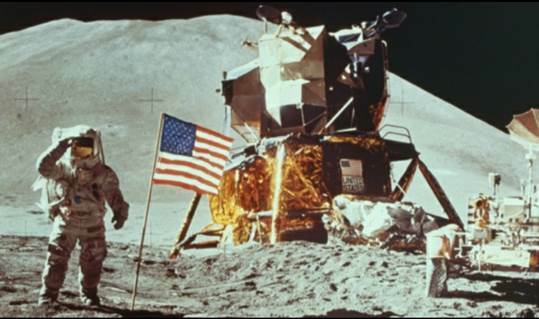 We watched Neil Armstrong step onto the moon in 1969, but by the end of the manned Apollo missions three years later, a bored American public was already demanding TV soap operas instead. Flying Saucers—the faded ‘Fifties’ fad that seemed so full of promise, just got lost in the shuffle. The U.S. Government continued its dour ridicule campaign. UFOs were labeled ‘temperature inversions’, ‘swamp gas’, or the ‘planet Venus’…foolish fancies of gullible ‘kooks’ or ignorant bumpkins--more pressing issues diverted public attention, like Vietnam, the Cold War and civil rights unrest. 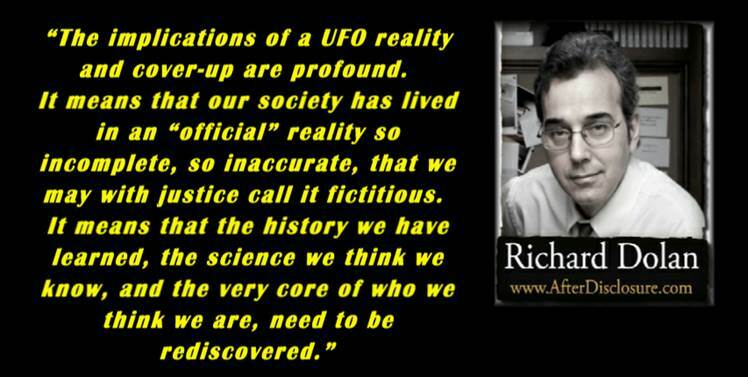 By 1968 it was obvious that UFOs were a secret that would NEVER be revealed! Tragically the most important event in all human history—actual proof that we share this universe with other intelligent life forms remained stonewalled by virtually impenetrable governmental obstruction, media hostility and general public apathy! Could it be that the strangest creatures in the universe are not extraterrestrials…but the humans of planet Earth? 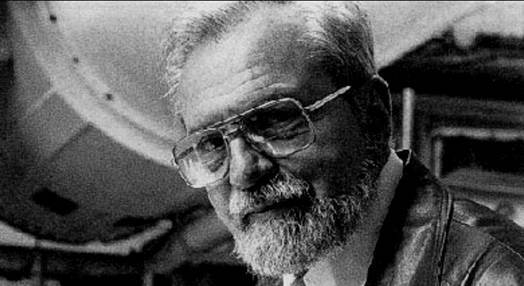 Even the late Dr. J. Alan Hynek, former advisor with Air Force Project Bluebook, finally broke ranks with the military UFO investigation program by objecting to its deliberate white-wash study of selective evidence and predetermined conclusions. 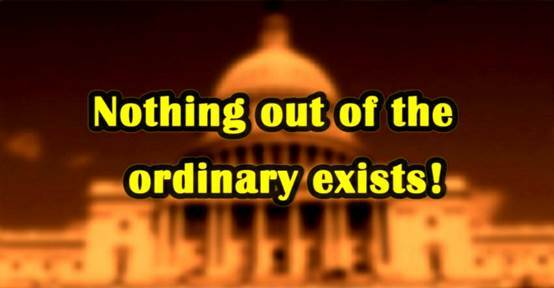 The government posture was then, and remains to this day, that… Nothing Out of the Ordinary Exists! 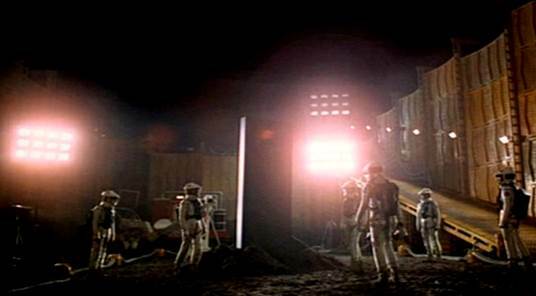 Ironically it was Hollywood that finally revealed the motives behind the UFO cover-up. 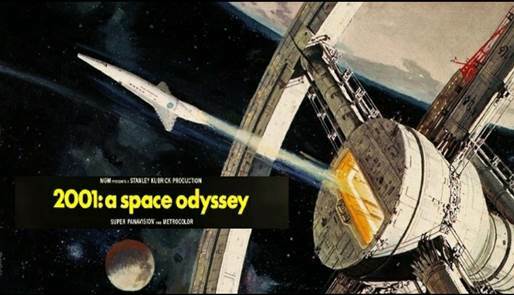 Back in 1968—just one year before Apollo’s trek to the moon—film maker Stanley Kubrick joined talents with writer Arthur C. Clarke to produce the science fiction epic of the decade, 2001: A Space Odyssey; An inspired vision of space travel, which would set the Hollywood standard for all cinematic space adventures to come. Originally released in sweeping, wide-screen Cinerama, Kubrick sought to capture the dynamic visual experience and awesome grace of space flight. 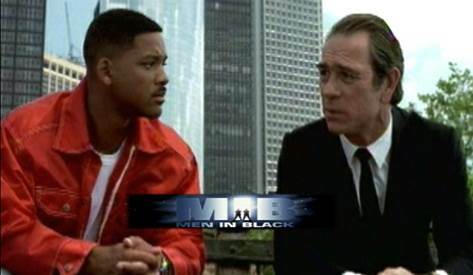 But, in this movie he also revealed just how politically ‘sensitive’ the issue of disclosing an extra-terrestrial ‘reality’ would be for the government. As it turned out, this was more than just Hollywood fiction. The movie scenario deals with the discovery of an ‘alien’ artifact—an imposing black monolith—on the moon’s surface, and the social dilemma that such a finding presented to federal agencies. The public at-large was deemed unready to face the reality of life from other worlds, and the truth of the monolith was covered-up. 2001 was lending keen insight into the real attitudes and policies our national leaders held toward disclosing the discovery of extra-terrestrial life. In 1960, just as the fledgling National Aeronautics and Space Administration—NASA—prepared to initiate manned rocket launches, a government study concluded that despite our technological advances, the rank-and-file of the public at large were not ready to face the potential discovery of extra-terrestrial life—an inherent risk of space exploration. 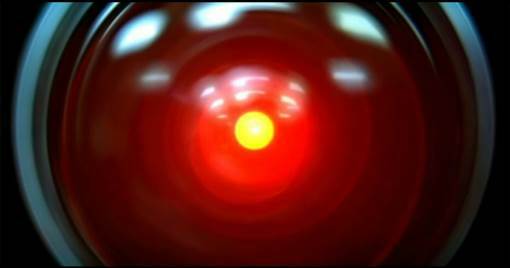 Perhaps Kubrick’s paranoid computer, HAL, was acting wisely after all in 2001 when he eliminated his ship’s crew. Maybe emotionally erratic ‘human’ has become obsolete. 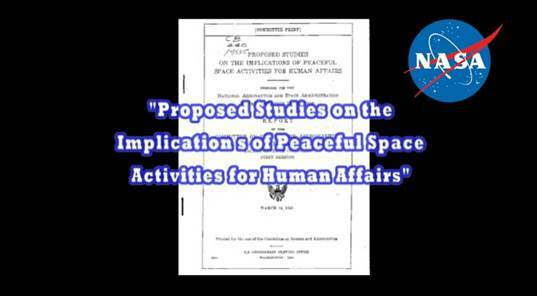 “…We have, indeed, been contacted—perhaps even visited by—extra-terrestrial beings, and the U.S. Government, in collusion with other national powers of the earth, is determined to keep this information from the general public. The purpose of the international conspiracy is to maintain a working stability between the nations of the world, and for them, in turn, to retain institutional control over their respective populations. Thus, for these governments to admit that there are beings from outer space…with mentalities and technological capabilities obviously far superior to ours, could, once fully perceived by the average person, erode the foundations of the earth’s traditional power structures. So there you have it, my kid-hood thrill, to ultimately discover all the ‘flying-saucer’ secrets, was a notion doomed from the start. The ‘flying saucer’ fad amounts to a sixty year legacy of circumstantial evidence, crammed with endless anecdotal, eyewitness accounts—which sadly amount to no proof at all. Ergo: UFOs do NOT exist! So, after all these many years I’ve come to the sobering, weary conclusion that my exuberant youthful anticipation for full disclosure about UFOs will likely never be realized—but at least I finally know…why! Despite my early, formative years as a ‘Flying Saucer’ believer, by the time I was an Army draftee in 1970 much of my youthful enthusiasm for the subject had evaporated. Our government contemptuously declared that thirty years of accumulated circumstantial evidence, eyewitness accounts, fuzzy photographs, weather balloons, and swamp gas amounted to NO proof whatsoever that UFOs were real! So, resigned to sullen skepticism, I abandoned interest in UFOs, certainly not because I accepted the ‘official’ government ridicule of the topic, but simply because I recognized how solidly stone-walled the subject had become. Anyway, that was my mind-set as of 1970, so how, you may ask, did I evolve from skeptical cynic to where I am now, a 35 year veteran researcher of ufology and exopolitics? My two year stint as a U.S. Army draftee marked a major turning point in my life. 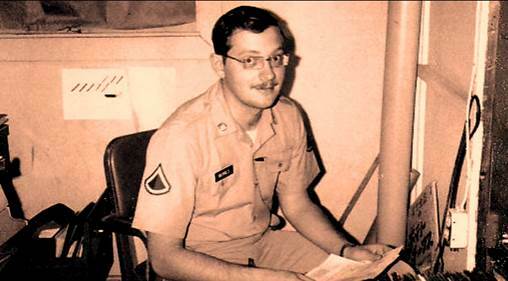 I served sixteen months as a pay-clerk at an Army Finance Center on Okinawa where I rose to the lofty rank of PFC. And although I had no involvement whatsoever in classified military projects, our finance office was located near enough to Kadena AFB, that I got to glimpse a top secret, Lockheed Black Bird spy plane parked on the tarmac one day. But military life held no enchantment for me, so by 1972 I had happily earned my discharge. I left the Army, but never returned to my home town in Ohio. 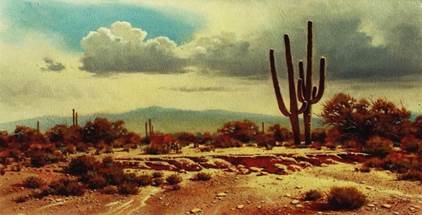 While overseas, my family had relocated to Tucson Arizona and upon returning to the states, that’s where I resettled as well. 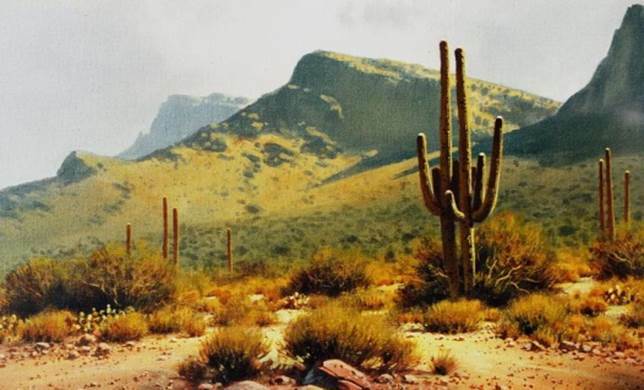 Southern Arizona’s rugged mountains and cactus were a radical departure from the rural Ohio farmland I was familiar with. My new home was as exotic to me as an alien planet. But that’s about all that was ‘alien’ to me--in the early 1970s, UFOs and extraterrestrials held little enchantment for the moment… Instead I was determined to carve out a career for myself as an artist. Over the ensuing five years I readily adapted to my new life in the Sonoran desert capturing the stark, rugged beauty of the world surrounding me on canvas. Charged with youthful enthusiasm I plunged ahead doggedly determined to make my mark in the world as a famous artist! Essentially self-taught, my artistry sprang not so much from formal academic instruction but simply a creative compulsion to paint pictures. And over the period of nearly half a decade I became reasonably skilled at my craft, though not nearly so skilled at marketing, so both fame and fortune continued to elude me. As well, rendering endless variations of cactus, mountains and sagebrush on my canvases was becoming repetitive and tedious… But suddenly, my sagging creativity was charged with fresh inspiration! Predictably, UFOs began to appear on my canvases. …paintings that caught the attention of artist/astronomer Dr. William K. Hartmann who commissioned me to provide an illustration for his textbook, Astronomy: The Cosmic Journey. Dr. Hartmann needed a rendering for a chapter that speculated about possible extraterrestrial influence on primitive humanity. One of the important disciplines of a diligent artist is to collect and maintain image files—visual references for future painting concepts. So I always had an eye out for dynamic visual source material, movies, magazines, books whatever… In those days I was totally inspired by the fantastic artistry of illustrators like Frank Frazetta, Boris Vallejo, John Berkey, Bob McCall and the like. As such I regularly haunted the mall bookstores keenly scanning the shelves for fresh ideas. At a Walden bookstore one balmy spring afternoon in 1980, just such a book caught my eye… a large picture book with a compelling UFO photograph right on the cover! Instantly I snatched up this volume discovering it to be an astounding folio of UFO photographs… flying saucer photographs better that anything ever recorded in fifty years of UFO reporting. Ha, ha, TOO good to be true, I scoffed, but GREAT visual reference material just the same! 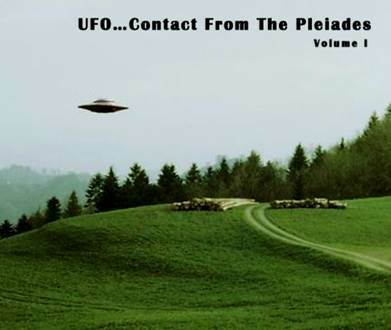 UFO:Contact from the Pleiades, Volume One went home with me that very day, but upon reading the text I discovered to my further astonishment this book contained the account of a UFO contact case in Switzerland that was being investigated by a Retired Air Force Lt. Col. who actually lived in TUCSON… Wendelle C. Stevens. This was a man I’d like to meet! 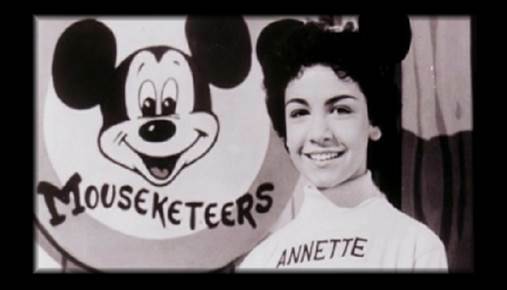 It seemed I’d barely formed the thought in my mind when a surprising synchronicity of friendship associations landed me a personal introduction to Wendelle himself. Just two weeks after purchasing his book, I found myself sitting in Wendelle’s study learning all about UFOs and the Contact from the Pleiades firsthand…! Wendelle was obviously convinced that the Swiss case was authentic, and digital examination of selected photographs by the Jet Propulsion Labs in California confirmed that a large object--nearly twenty feet in diameter—at some distance from the camera had been snapped on film. 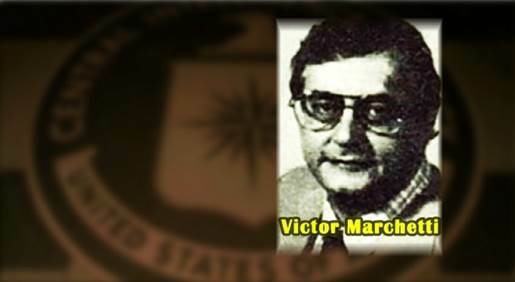 Wendelle had twenty years’ experience as an independent UFO researcher, was a skilled pilot and retired Air Force officer—if he was convinced, I was convinced. His excitement and enthusiasm for this case were genuine and infectious. 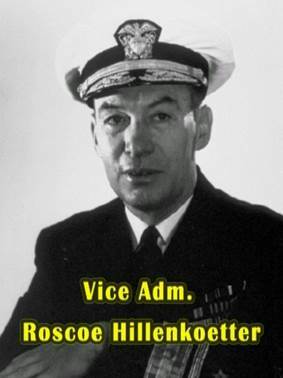 Based on the wealth of evidence he had already accumulated on the Meier case it appeared that he was on top of the most authentic UFO contact case of all time; definitive proof of an extraterrestrial reality! Close Encounters--Sitting there in Wendelle’s study I suddenly felt like I was actually living the movie Close Encounters! This stuff was REAL! 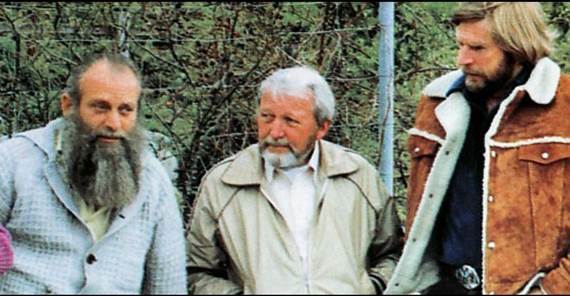 One of the peculiarities of the Swiss contact case was that the visiting aliens did not permit the farmer Billy Meier to photograph either their ships parked on the ground or the aliens themselves. Aha! Here was an opportunity for me to join Wendelle’s investigation as an illustrator. So based on photographs in hand of the space ships coupled with Billy’s description of the extraterrestrials I fashioned a preliminary rendering of how a landed Pleidadian beamship and its pilot might look. In turn Wendelle carried a snapshot of this painting for Billy to critique on his next visit to Switzerland. Here you can see ultimately how I incorporated Billy’s suggestions into my finished painting. Of course this was not to be my only UFO painting inspired by Contact from the Pleiades, which remains to this day my favorite UFO case. Over the next ten years I busied myself with many more UFO illustrations, some based on actual cases, some based on historical speculation and some… just for fun. a scene which surprisingly appeared years later in Steven Spielberg’s 2008 movie Kingdom of the Crystal Skull. You don’t suppose Spielberg and Lucas just might have seen my art online??? Of course painting flying saucers was far more of a ‘hobby’ than a serious commercial venture; in fact the struggle to make any kind of living as an artist had become so difficult that by 1981 I had no choice but to go out and get a ‘regular’ job--working full-time for the Tucson Public Library. 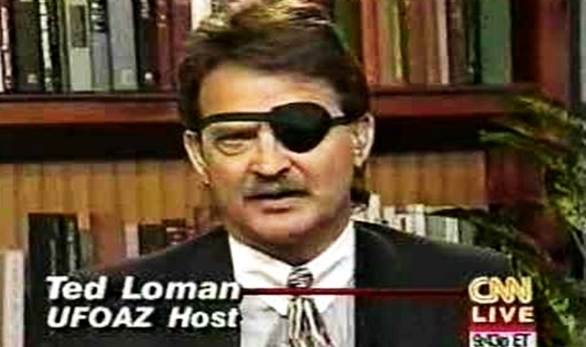 So on July 11, 1991 we launched the premier episode of UFOAZ Talks on Tucson Public Access Television—a date which curiously coincided with a mass UFO sighting reported by millions over Mexico City! It must have been a fortuitous omen, because it wasn’t long before Ted and Jim’s TV enterprise took on a life of its own. Over the short span of seven years our live weekly broadcast of UFOAZ Talks matured from bantering silly flying saucer trivia to serious exo-political discussion. In 1994 Peggy Kane joined our production team as a regular co-host lending a balancing feminine synergy to our UFOAZ success. With a strictly volunteer crew and no budget, our award winning show earned popularity on public access channels across the country. We interviewed a veritable parade UFO researchers and experiencers from all walks of life from all over the world each with their own fantastic tale to tell. 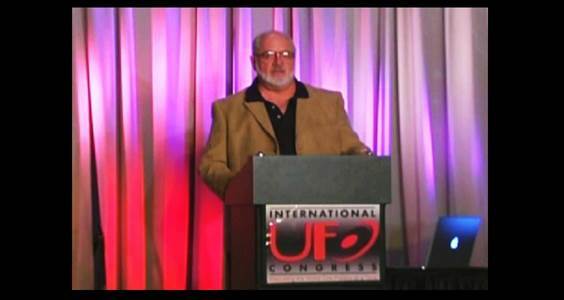 A major contribution to the success of UFOAZ Talks was regular guest appearance of Bob Dean. 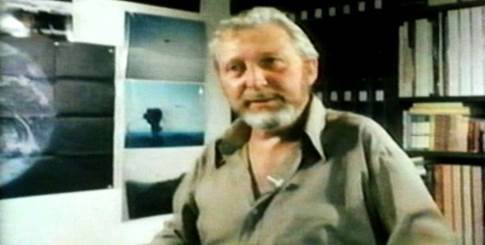 Bob was yet another retired military professional who had a profound personal involvement with UFO research. 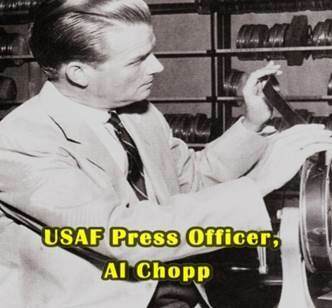 In 1991 while employed by the Tucson Sherriff’s Department emergency services division, Bob made national news when he decided to publically disclose classified UFO information he had access to while serving as a non-commissioned Army officer at NATO headquarters in the early 1960s. At the height of the Cold War UFOs were regularly violating restricted airspace over Eastern Europe; posing a chronic threat of accidental nuclear war with Soviet Russia. 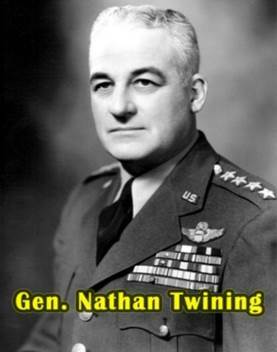 NATO Commanders in France commissioned a detailed secret study of the phenomenon, which Command Sargent Major Robert O. Dean had classified access to; a study that confirmed planet Earth was in fact being regularly surveyed my multiple extraterrestrial groups. 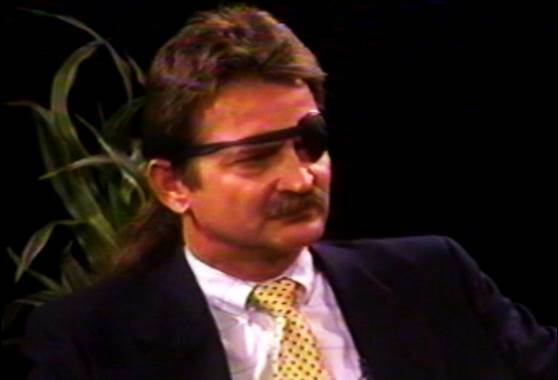 After honoring his secrecy oath for thirty years Bob decided the tax-paying public had a right to know that their government possessed full knowledge of the extraterrestrial reality! 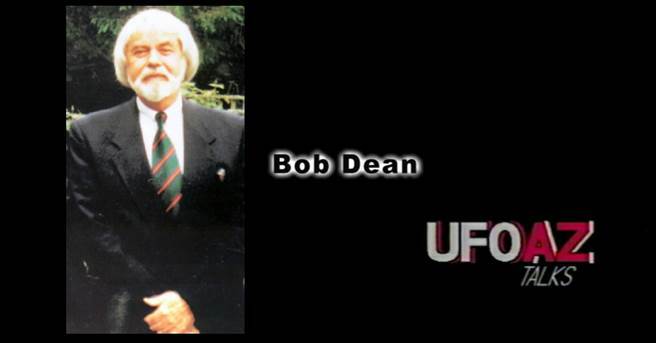 Bob Dean, a faithful patron of my UFO art, became a dear personal friend and when he launched a Congressional campaign for UFO disclosure called Stargate International, I was honored to write editorials for his published newsletters. But in 1997 the whole issue of UFOS was tainted by the Heaven’s Gate mass suicide fiasco in San Diego, where members of a UFO cult took their own lives allegedly at the bidding of gray extra-terrestrials. Full mass media coverage of this lurid debacle put our TV show in the national spotlight, considering we had taped interviews with Marshall Applewhite’s cult followers months earlier. Ted pressed ahead with his show, but I’d had enough. 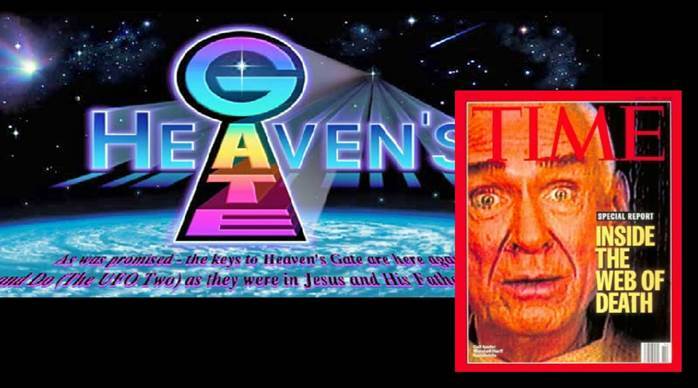 After seventeen years of UFO research, illustrations, and TV talk shows the Heaven’s Gate scandal left me angry and disillusioned. That same year Bob Dean’s disclosure initiative faltered into disarray. Obviously no matter how compelling the evidence, no matter how credible the witnesses, serious UFO disclosure was doomed to be forever ridiculed, reduced and marginalized into inconsequential nonsense by anonymous political forces that seemed virtually omnipotent. Alas, in 2009 I cautiously decided to catch-up with 21st Century technology and invest in a computer, but upon my timid, trembling baby-steps into electronic mass-communication I was simply astounded to discover my UFO illustrations were posted everywhere on the internet! I’d become a world renowned artist without ever realizing it! 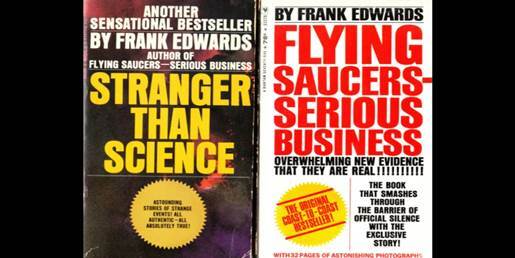 I knew there were UFO stories out there that simply could not be properly told in a chit-chat talk show format, one of which was the persistent myth that flying saucers had actually been constructed by German engineers during World War II, yet this astounding conjecture had only gained fragmented and cursory attention in a random variety of UFO books over the years. The idea of Nazi flying saucers seemed so intriguing that I produced a number of paintings to explore just how those wartime saucers might have looked. My first attempt at a video documentary project was to assemble these paintings along with a collection of anecdotal historic references into a single coherent narrative. It was the most challenging and engrossing creative experience I’d known thus far; combining photographs, original paintings, newsreel clips, music and written narrative into a functional video presentation. The final result completed in 2010 was entitled; The Aldebaran Mystery, and it premiered publically in the film festival at the International UFO Congress at Laughlin, Nevada in February of that year. But once again making UFO videos would be yet another project that would take on a life of its own… I entered Aldebaran Mystery in the Congress film festival as a kind of demo-film hoping to catch the attention of serious film makers in the audience. 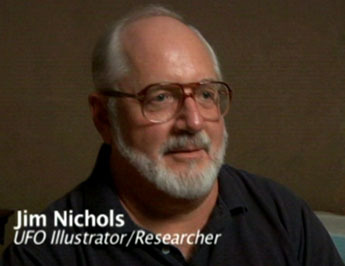 Like producers from the History Channel, or Discovery Channel. 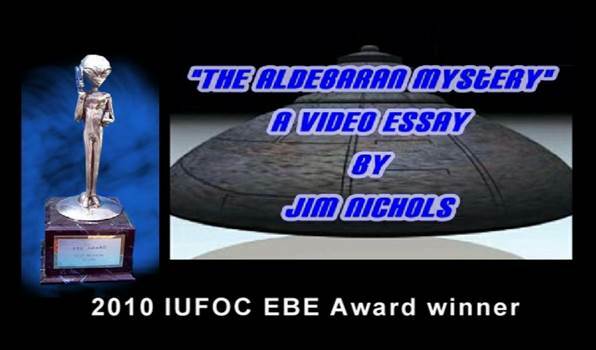 Instead my film won two ‘Ebe’ awards on its own merit and the attention of producer Tim Crawford who pressed to have it aired on his UFOTV Youtube channel. The rest, as they say, is history… Six years and twelve video productions later my video documentaries on UFOTV have graduated from Youtube to Amazon Prime. 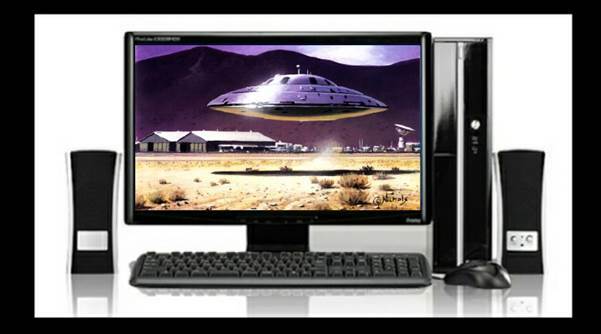 These productions span a vast spectrum of UFO topics and have been watched by more than four and a half million viewers. So, are UFOs real? Of course. Are they extraterrestrial? Yes, but some are theirs and some are ours. Then why can’t we know about UFOs? Why does this remain a topic that doesn’t work socially or politically? What agencies have the motives and the means to keep this issue locked down for more than fifty years? 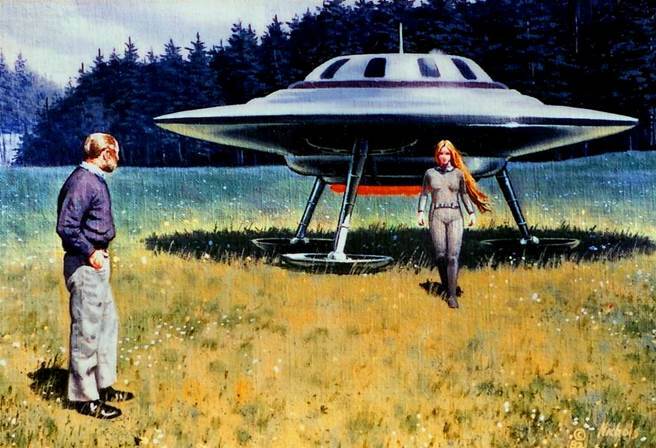 Who would most benefit from UFO secrecy? I suspect the UFO reality is not so much a national defense issue as it is an economic issue. I suspect that full UFO disclosure would reveal, not so much that an ‘alien’ reality would spark mass public panic, but that international bankers, petroleum industries and multiple defense industries that have kept the human race in virtual economic slavery for more than a century, now possesses quantum technologies to exploit the natural resources of any planet in the galaxy. 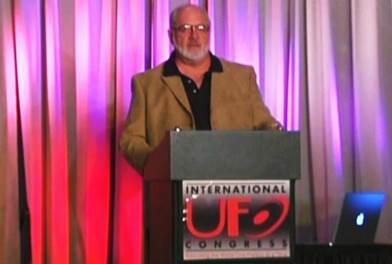 Full UFO disclosure might reveal what a threat Earth humans have become to the rest of the universe! The fundamental science of free energy and interstellar space travel was fully described by Nikola Tesla in a New York Times article as early as 1908. In 1995 Aerospace engineer Ben Rich revealed defense contractors have since mastered those technologies and in 2001 whistleblower Gary McKinnon revealed those same defense contractors have deployed their own space fleet called ‘Solar Warden’… a fitting name for guardians of a prison planet. The technological skill to fashion the very fabric of time and space into nuclear weapons can also fashion the means to deliver such weapons anywhere in the cosmos. And now these skills are in the hands of the most lethal predators on our planet—humans! The question remains, will extraterrestrial civilizations meekly permit earth humans to exploit any planet they wish across the galaxy? Meanwhile the mass media which is owned and operated by the ruling elite endlessly promote xenophobia; marauding aliens attacking the earth, the truth may in fact be the exact opposite! The ‘disclosure-dis-connect’ lies in the obsession to preserve the status quo of social stability, the National Security State that sequesters these quantum technologies has become so far removed from mainstream Americana that it has evolved into a separate, high-tech empire unto itself—an elitist hybrid civilization literally ‘dis-integrated’ from its parent civilization. As well, spin-off technologies that could easily benefit the mainstream population continue to be deliberately withheld. So, more than the cultural shock of an extraterrestrial reality, the economic shock of disclosing free-energy quantum technologies would likely precipitate a global meltdown of the dominating petroleum-based geo-political infra-structure. 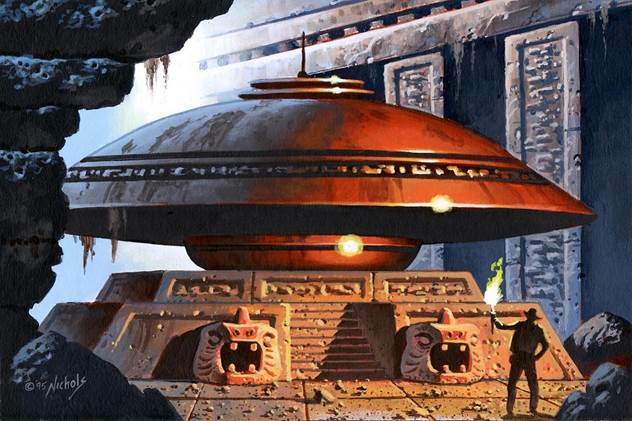 I also agree with Richard Dolan that UFO disclosure is both impossible and inevitable, but disclosure ultimately lies in the hands of the extraterrestrials themselves and it would require some kind of mass global event that no agency of this Earth could possibly deny or cover-up.